If That's You, Then Read On! Instagram is a minefield, and the internet is an even bigger minefield of advice. You may well have an entire folder of Instagram ebooks that you've downloaded off Pinterest, or perhaps you've wasted several hours watching webinars. You're trying to grow your Instagram, increase your engagement, take better photos and get customers to buy your product and yet all this advice (and the tips, tricks and hacks) are leaving you confused and exhausted. You probably feel like you're spending too much time on Instagram and yet not seeing any of these 'guaranteed' results. Instagram for Business Level One, is your first step to creating a bona fide business account that tells your brand story through images and captions and captivates your audience to take action, to sign up for your mailing list, to read your blog and most importantly, to buy. Unlike many of the Instagram courses available, or the free advice and ebooks, this course teaches you the basics of marketing and shows you how to apply it to Instagram. The learnings you will take from this course (and Level Two) will carry through to all your other marketing touch-points. "I have been and will continue to recommend the courses to my creative pals. This is by far an essential course for any small business on social media." This course is all about the fundamentals of your brand so that you that you have a clear identity and you know exactly who you are selling to and what makes them tick. Many business owners make the fundamental mistake of trying to appeal to everyone to maximise sales and this backfires. If you try to speak to everyone, you will be heard by no one, if no one can hear your message then nobody will buy. We start by running through the essential steps to ensure your account is discoverable by other users, many of which are completely overlooked. We then review the aesthetics of your account and I teach you why you need to think "Magazine" and not "Catalogue". In this chunky module, there are a series of exercises for you to work through to help you to style images that don't take hours, require no fancy software or even a special camera. We then look at your brand mission, values and voice and why this is so important. If your customer can identify with your values, they will be a customer for life. Finally, we look at who your dream customer is and what makes them buy so that you can attract more of them. As you work through the course there is a downloadable, printable 14-page workbook, complete with tasks that you can action. An hour of audio support, split module by module so that you can listen on the go - a feature that has proven highly popular with past students. Enrol today and learn how to build a brand that has customers coming back time, and time again. Sam Burgess is the founder of Small and Mighty Co. and a leading expert in content marketing, independent retail and modern-day consumer behaviour with a career spanning over 15 years in the industry, with features on the BBC and iNews. In addition to consulting, Sam is the host of an iTunes top 40 business podcast "Small and Mighty Conversations" celebrating the small business owner and creative entrepreneur. 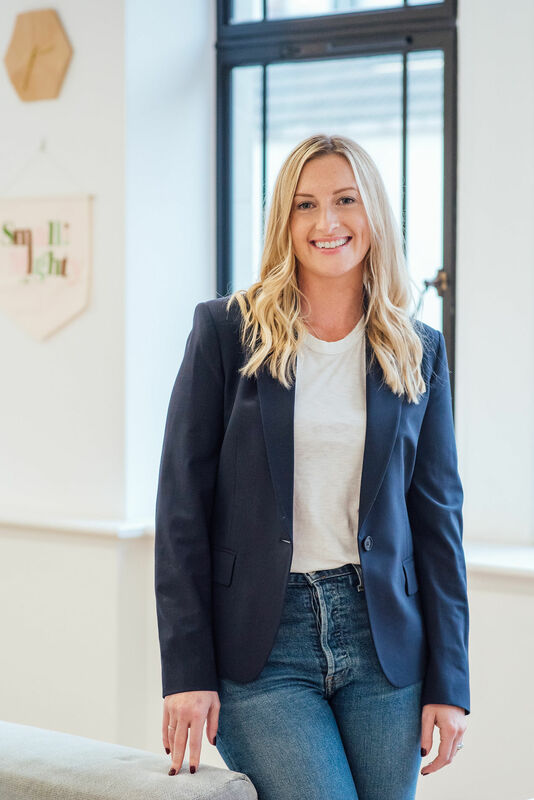 Sam is a sought-after marketing thought-leader and public speaker, with appearances at several of the UK and Europe's largest tradeshows, including Pure, Pulse, Top Drawer, Bubble and MODA. Is Your Brand Voice – Narcissistic? I am really sorry to hear that, and it's something I hear a lot (and have bought several myself to find out the tricks they guarantee to get you thousands of followers and many teach you which bots to use and the follow/unfollow method). This course will not guarantee you thousands of followers, but it will support you to build an audience that cares about what you do and will buy from you. This course is an Instagram marketing course, not a course on taking pretty photos or to teach you how to 'game' the algorithm. All my courses are filled with actionable marketing advice, gathered through years and years of experience and education. You can also take comfort that you are learning from an invested instructor and marketing professional with extensive experience of working with small businesses and retailers. As the course content isn't drip fed, there is no set time as it will differ from person to person. If you set aside two-three hours a week, you should be able to complete the course in six weeks. The course is designed for retailers and businesses that sell an end product to a consumer. I don't personally recommend my courses for service businesses, but I have had service businesses enrol and still benefit from the course content. If you're unsure whether this course is for you drop me a message on Instagram @samburgessuk. I've attended your How to Build Your Brand Instagram course, is there any point in me doing the online courses? Yes, definitely. The 'Build Your Brand on Instagram' workshop only scratches the surface in 3 hours, Instagram for Business Level One and Level Two dive much deeper into your brand, marketing and Instagram identity. I would like to think they complement each other and have had several students attend both the online and offline courses. Each module has full text - if you prefer to read then that option is for you. If you prefer to listen to the audio, each module has its own 'mini-podcast' for you to download (almost an hours worth) and listen on the go, or read along. All my courses have a downloadable PDF ebook for you to read through and complete the tasks. There is, however no video content. No, sorry. As this not a drip-fed course and contains downloadable audio content, no refunds will be given. If you're familiar with my work you will know that everything I do is with my heart and soul and the content I create is high quality. I truly believe that if you complete it in full, utilise the discussion threads and apply the learnings to your business, it will be well worth every single penny of your investment.